I have a small Mersman desk #7457. I have only found 1 similar to it which is a 7092 on e-Bay. I would appreciate any info you have on it and want to know approximate value of mine. So I think this piece is the sister piece to your desk (which means if they are from the same lineage yours is a 1940s piece)--in the Federal Style. Yours has the insert to make it into a desk, this one has the full bottom making it more of a hall table. The person is asking boatload for it since it was refinished (which usually reduces value--but it does look like they did a professional job on it). The desks are rare (at least where I am) and I have never seen one live and in person. That just means there aren't many in Pittsburgh...where you are they could be a dime a dozen! You may want to talk to a reputable vintage dealer in your area to find out the value in your town. If the supply is high and the demand low, the value will be lower. If they are rare like here, the value could be higher! If you are are looking for a down and dirty sale of it, you could start it like this guy on eBay (but reduce since yours has some condition issues). It if were mine...I would probably start at 200 and take less. I don't recommend eBay or online sales...you will do better (not having to ship) trying to sell it on a site like Facebook Marketplace or Let Go or Next Door or even the local newspaper classifieds or a tag sale. It is lovely!! Mersman made things that were inexpensive at the time, but built to last and they did!! Post back if you are able to sell and for how much and what part of the world you are in so we can all learn!! This is a nice, unusual piece. I have not seen anything like it. Im sure it goes for over $250. If I were you, I would take this picture to a dealer. There are so many different styles of Mersman tables available that it would be almost a miracle to find an exact table and even then the condition and location would change the value. Many people who can afford to buy tables costing more than $200 and up consider Mersman to usually be low-end tables and will pay more for what is considered a "high-end" brand name. (There are some Mersman tables that are considered high-end but the name Mersman may still keep the price low). Also, marketing surveys have shown that most people will pay more money for the same item if purchased from an "antique dealer". Dealers are assumed to know what they are talking about so the buyer will pay more for that assurance. Furniture of any kind is very slow to sell even at good prices but then some sellers are lucky and someone buys within a few weeks/months. It is very difficult to date Mersman furniture and you will find most sellers just list it as "mid-century" but then a lot of sellers will say "40s" when, in actuality, they do not know when the piece was made. 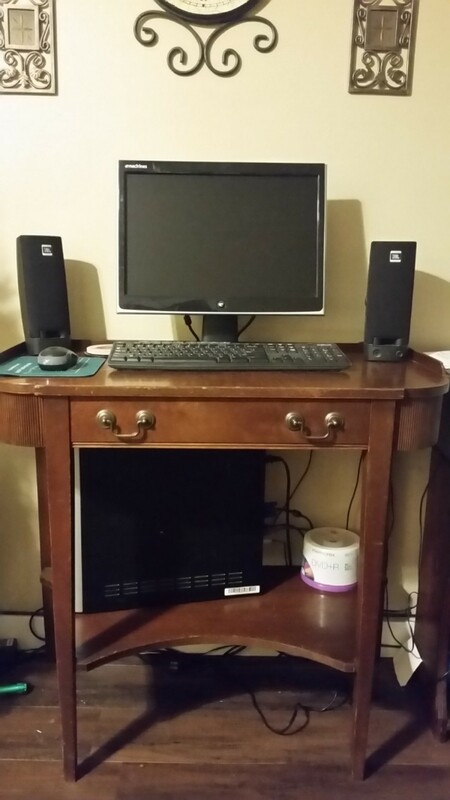 If your desk was cleaned up and is in very good condition it may be possible to sell it for $250 but it may take a year or longer to sell or it might sell overnight. A lot would have to do with the area you advertise in as shipping adds a high cost to any furniture. Many sellers just list as pick up only and that is almost the same as listing on Craigslist. Here is a link to recently sold Mersman on eBay so you can see what prices are being paid. The most popular style Mersman tables are the Harp and the long coffee tables. This listing would be considered Mersman "high-end" styles. But will it sell - even from a dealer? Here is an older article from a "collector" that kinda explains what I am referring to as "low-end"
You may be interested in reading some history but there are many articles available on the web. It is possible that you could ask your question on this site and someone may be able to give you more information but you will have to submit pictures of the complete table and also of the Mersman markings or they may not help you.